MitraClip Therapy is a form of minimally invasive surgery/procedure which is used to treat patients suffering from Mitral Valve Prolapse (MVP) with Severe Mitral Regurgitation (MR). The mitral valve is one of four valves located at the heart, namely between the left atrium and left ventricle. The mitral valve has two flaps or ‘leaflets’ which opens and closes to control the blood flow between these two chambers. When this valve does not close completely, backflow of blood in the left ventricle may occur resulting in Mitral Regurgitation (MR). In severe cases, reduced blood flow is pumped out of the heart. This creates excessive workload on the heart, leading to dilation of the heart chambers. Very often, the symptoms appear to be very mild. Patients can experience symptoms such as shortness of breath, fatigue, heart palpitations and chest pain. A very small percentage of patients, when the condition is untreated, could suffer from heart failure, heart attack and even death. How are symptoms of MVP with MR detected? Normal means such as using a stethoscope are capable of diagnosing MVP. While using a stethoscope, a clicking sound can sometimes be heard after the ventricle begins to contract. The clicking sound reveals tightening of the abnormal valve leaflets against the pressure load of the left ventricle. A whooshing sound can be heard immediately after the clicking sound if there is regurgitation of blood through the abnormal valve. Echocardiography is the most accurate test to detect MVP. It can measure the severity of the prolapse and the amount of MR. Other tests may sometimes be necessary, including the 24-hour Holter Monitor, which records the patient’s heart rhythm over a period of time as the patient goes about his usual daily activities. How is MitraClip Therapy done? In the past, open heart surgery was the only option. 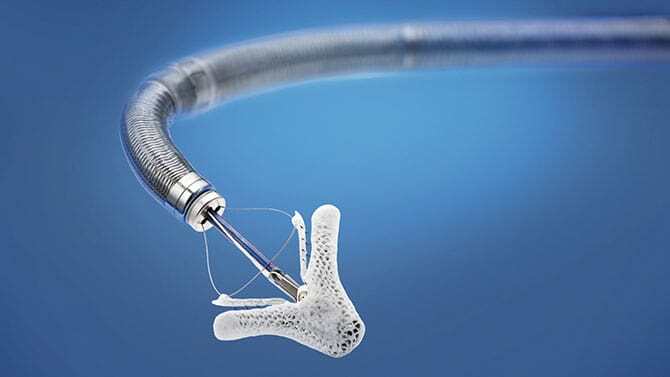 MitraClip Therapy is a minimally invasive catheter-based procedure intended to reduce MR. The patient would be put under general anaesthesia, with the entire procedure taking approximately two to four hours. A MitraClip device is attached to the catheter, guided along the femoral vein (around the upper thigh area) to reach the heart, at which point, the clip delivery system delivers and deploys the MitraClip device. The entire procedure is done without opening the patient’s chest. Different patients undergoing MitraClip Therapy will encounter different risks depending on their condition. Patients are encouraged to discuss the risks of MitraClip Therapy with their doctor and compare it with other options available.. Once the procedure has concluded, you will be transferred to the cardiac monitoring unit for a day. Upon reviewing the results, you may be transferred to the regular ward for another two more days before being discharged. Other tests conducted after the surgery include a repeat transthoracic echocardiogram, blood tests and chest X-ray. You may also be given blood thinners such as aspirin or clopidogrel for six months. Other medicines you have been taking before the procedure may be continued or modified. Most patients who have gone through MitraClip Therapy do not require special assistance at home.